I am in wedding mode all the time now. I was in church, daydreaming about if my grandma would be able to walk all the way down the aisle. I was out watching a band the other night and wanted to pull out a piece of paper and starting writing down our guest list, just to double check the count. That's why I love having a wedding blog so much. I can just sit here and babble about weddings as much as I want and post it, like my post the other day about bathroom baskets. 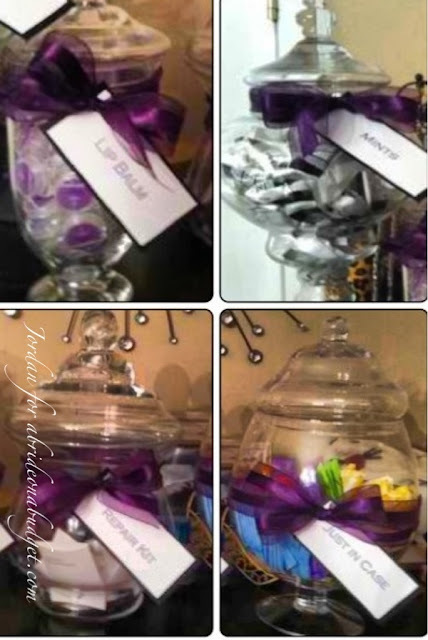 These are the baskets that she made for her friend's wedding in September. She bought the jars from Home Goods and it appears she used ribbon and favor tags (you could also use organza too, which has become my new obsession since getting engaged. I sorta really love tulle too but I'm not sure if you pronounce it tool or two-lay or c, none of the above so I always just say organza). If you can't read them, clockwise from the top left are: lip balm, mints, just in case, and repair kit. If you wanted to do something like this, you could pick up personalized lip balms and get some wedding-themed buttermints (I love those tux ones, by the way). Using glass apothecary jars instead of baskets are a way to let your guests see everything that is inside -- although I'm not exactly sure what is in the just in case jar. I guess it's a mystery until you open it. BRIDAL BABBLE: What do you think one of the items in the just in case jar is? Looks like feminine hygiene products to me! For goodness' sake, it's a few hours at a wedding, not a desert island. Is all this really necessary? Necessary is dependent on the individual, I guess. If Aunt Flo comes to visit in the middle of the wedding and you were not expecting her, then yes, this is necessary. You don't want to run out to CVS in the middle of the wedding for tampons!